If you have been swimming a while on your own, you are a beginner swimmer, seasoned triathlete or swim coach. There comes a time when the imagination and inspiration is not working in your favor and you cannot come up with a good swim practice that you haven't done before, if you are a beginner you just do not know where to start, or better yet, you just want to break out of the usual and try something else. You never know what swim sets might work for you until you give them a try. I found a few pages where you can get help in finding a good swim workout for yourself or for your team. I am sure your swim team sometimes appreciates a change from the your routine, so keep them interested in this wonderful sport and vary your training. Also, let them have fun once in a while. Check here for great sprint breaststroke workout or lung capacity drills. If you know of more swim workout databases which are being updated or are opened to public, please feel free to share them in the comments section. Get more tips to improve your swimming by joining our growing Swimator Facebook community or following us on Twitter @360swim. It looks like that the most requested topic in the last poll on the Swimator blog is about freestyle. Well, let me talk to you about how to get the most power out of your stroke. After you learn how to properly hold your body in the water and relax you can move on to starting to use your arms to propel yourself forward. There are several phases to freestyle arm movement in swimming, but for this post I'll only focus on the so called "catch" at the beginning of the stroke. One of the key things you need to do at the beginning of your freestyle stroke (that is when your fingers enter the water up front) is to make sure that you actually catch as much water as possible. Imagine wrapping your arm around a barrel which is laying on its side. You need to reach over the barrel keeping your elbow up high in order for your arm to bent and grab the barrel. This is called getting your initial catch for your stroke. The picture below sort of illustrates what I mean, but in this guy's case, he is only half way and if he were doing our exercise, he'd continue to move his fingers down the barrel until his chest would touch it and his elbow would be nicely bent. Then he'd push the barrel behind him, so it rolls off. In other words, he anchors his hand right in front of the barrel and then move his body over the barrel (if he were in t e water). So, now you understand what you need to do. To help you with this, there exists a special paddle called the TechPaddle and also the Antipaddle. These inventions for swimming enthusiasts are quite nice for beginners and also more advanced swimmers to learn how to actually catch water and not drop their elbow. Most beginner and many experienced swimmers drop their elbow which means their elbow is leading the way under the water when executing their freestyle stroke. Instead, try keeping the elbow at the surface and have your palm lead the way towards the back. The TechPaddle and the Antipaddle helps you with this quite nicely. Below you will see a great explanation of the way this should be done and how the TechPaddle helps you. Don't get scared by the title Early Vertical Forearm (EVF). In laymen terms it just means do not drop the elbow and catch water in your early stroke. If you end up buying or you are already using the TechPaddle or the Antipaddle, please do let us know how that worked out for you. Swimming, as we have always been told, is called the ultimate, all-around excercise activity. It is said that swimming works all of the body's major muscle groups, has little impact on your joints and can burn as many calories as going for a run. Well, the problem of the last statement with the calories is the length of the exercise. A swimmer needs to swim a lot longer to burn the same amount of calories as a runner. However, on the other hand, it is much tougher for swimmer to move through the water than a runner through the air as water is more dense than water, thus provides much more resistance. Let's look closely at all major muscle groups statement. Is it a truth or a lie? To help us bust this myth or not, I found the following video which gives us insight into what muscles are actually being used during swimming of all the strokes. The video is a work of Dr. Nakashima from the Tokyo Institute of Technology and I am not sure anything else needs to be said, just watch and you will form your own opinion. So, to answer the question, "Can dryland exercises help me improve my swimming?" we would have to state that it is a BIG YES, so get out there and start doing something. If you ask top athletes out there about what makes them give it a 100% at practice even if the body says no? Well, usually the answer is quite simple, the thought of their goals being fullfilled motivates them to achieve the impossible. Of course, let's come back to earth and realize that we are all human and succumb to weakness, however, there are some tools you can use to help you overcome your laziness or whatever it is that keeps you away from the desired excercise. For most of us it is not enough to put a poster of our opponent on the wall and stare at it every morning as Michael Phelps claims (or would it be the money ? :), so we need something else to keep us going. Especially, if you used to be a competitive athlete and now just trying to balance your family, work and staying fit. 1. For some it is the group sport aspect. The thought of having other copatriots to show up for practice is a huge boost to your ego. You don't want to be the one that does not show up. Obviously, this works only if you have a certain personality and a good group of lads or ladies to go with it. I know this is a huge help for me. 2. Another great motivator for those of us with a need for gadgets is a new technological toy to go along with your training. Try getting a heart rate monitor to motivate you or even better, the newish Nike Plus series shoes which can be fitted with a chip connected to an iPod which will let you know how far you ran and graphs your progress on a chart on Nike's website. Not too shabby to get you going. You can even have a company or a friend competition who will run the most kilometers in half a year etc. 3. Sign up for a race. Triathlons or open water swims are a great way to get into the sport and also now you have a tangible goal with a real date to motivate you. This works like a charm, just try it. Nobody wants to be embarassed, coming last in a race and most of all, the worst feeling is when you race and you feel out of shape. 4. How about adding some music or podcasts to your swimming fun. 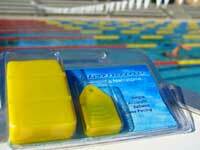 The waterproof MP3 player by Finis is a good choice and will keep you motivated as you plow through the waves. To summarize all these examples with just a few words, "set some tangible goals" and you will see the change happen. Here is a little something that might help you start with the goal setting. Google has an online document suite where one can build text documents, spreadsheets, presentations and store them online, so access is from anywhere. They have lately came up with new templates for their spreadsheet solution and here is a modification of one of them to help you with your triathlon training and hopefully add a little spice into your motivational training. Visit http://spreadsheets.google.com/pub?key=ptgf5FDNotd9roFIMqPrqZQ. On the bottom of the sheet you will find instructions on how to fill it out. These were mostly taken from Google's initial template. Of course, feel free to change it to suit your needs. Or if you prefer visual stimulation to get you going, checkout how life puts walls in your paths, so you are up to the challange and climb over and not stop. Have fun and if you want, let me know what it is that motivates YOU. After a long procrastination period of not writing and no maintenance, I was finally able to put some time and effort into the Swimming Hub site. And the result? Well, you can see for yourselves what has changed. The design is a bit different and with the additions of tabs, you can find your related topics easier. Check out also the poll on the right hand side and let me know what you would like to see on this site in the future. Happy Swimming :). I have had a few swimmers comment on this blog about their stroke and the rhythm, so I decided to put the following info together for you. a stroke with every beep to improve the stroke rate of the swim. Stroke rate is basically how many strokes a swimmer takes per minute. This is very dependent on what stroke you swim and what event you swim, but the basic idea is the same. An ideal stroke rate is different for each person, however, if it is too low, dead spots appear in your stroke and if it is too high, you are probably not pulling the right way and might get tired too fast. Hence swimming with Wetronome will help you achieve the ideal rate for you and improve upon it, so your stroke is not off rhythm as some might say. I am not too sure how long I could endure constant beeping in my ear, however, the beauty of self setting the timing of the beeps is great. I'd say if you can find a few songs with the same beat and put it in your iPod and waterproof case, it might be a bit enjoyable. Anyhow, the idea is quite nice and the guys from SwimSmooth have put together an explanatory video and an article which will tell you more about how it works and why one could improve their stroke with using the Wetronome. If any of you already tried the Wetronome or are going to give it a whirl, I'd be very glad to hear your comments as to how you liked it, so don't be shy and tell me what you think. After Michael Phelps' another stunning performance in the Beijing Olympics, it is only appropriate we find out what is hiding behind the scenes of his phenomenal swims. Apart from a great amount of swim practice with his coaches, have you ever wondered what it takes to swim as fast as Michael Phelps? Well, for starters biology has a lot to do with it. For example, his ankles bent by 15 percent more than most folks, so one can say he is hyperflexing his ankles. Not moving too far on the body, his feet are stunning size 49.5 (14) which is quite unusual for someone only 193 cm (6ft 4in) tall. His legs are quite short in comparison to his upper body, so he can stay afloat in much more streamlined position since his legs are not weighing him down. As I already mentioned, his trunk is longer than usual and his arm span is over 2 meters which is also unusually large for having height of 193 cm. And of course his hands have to be quite large, so he pulls large amount of water with each stroke. Second advantage that helps in breaking world records is the now infamous LZR Speedo body suit. It is thought that the suit helps cut resistance in some parts of the body by more than 24%. The LZR Speedo suit is made out of special polyurethane rubber which helps the glide in the water. It is said that the overall speed gain is about 2%. However, that being said, most of the top swimmers these days have access to one, so apart from some sponsorship issues, this is really not an advantage over the entire swimming field, more just over the past world records. It could be speculated that this suit helped form 56 new world records this year already. However, beware, small advice here. If you are not a top notch swimmer who is going to be breaking world or country records, you might want to reconsider buying one of these LZR Speedo suit bad boys. The price is quite expensive and what is even more frustrating for a regular bloke is that the suit does not last very long (perhaps 5 swims) and is a horrible task to put on where you can bruise some knuckles :). If you are into the full body suits, I'd suggest sticking with some cheaper option for now, even from a different brand like TYR and Arena. Thirdly, after Lance Armstrong, the American public needs another big hero which helps them through the day. So, Michael has the biggest support out there for whatever he does. I can imagine he has the best nutritionist, sports psychologist, doctor etc. etc. which obviously is not taken lightly. I would be very interested in seeing a comparison between Laszlo Cseh's life and Michael Phelps', that would be some interesting reading. Well, do not take me wrong, I believe Michael has put in his hard work for sure, he is determined, very talented and he dreams big. Without those characteristics, he would not be where he is, but he does have a little (or more) help out there:). And here is something for you at the end. BTW, did you know his middle name was Fred. I'd say he does look more like Fred than Michael. Well, I haven't really been posting in a while (my apologies) as I've been traveling around the world and still am for a few months, but this news I had to share with some folks or actually more get your input on what you think. Some of you have probably already read the articles or saw the results from the recent competitions where a lot of world records have been broken. The speculations are just to say that these records were set due to the new Speedo LZR Racer body suit which was warn by all the record breaking swimmers. NASA to help them out with this one. However, I do have to admit they do look very slick as depicted on the included image which was taken directly from the Speedo website. The suit has no stitching and has bonded joints like the space shuttle. If you want to own one of the beauties, well, get in line as you can only pre-register for a "chance" to own one :). I must admit, I am a bit on a border on this one. On one hand, I am all in favor of modernization in sport, but on the other with this suit supposedly fitting like a corset which aids your body into a streamlined position, is this really a necessary addition? 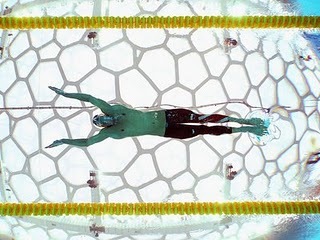 I guess as long as everybody has one it should be a good advancement in the world of swimming. What do you think? Update: FINA has banned these suits from competition, because they aid in flotation and also in streamlining the swimmer, so the swimmer swim with a lot less resistance.